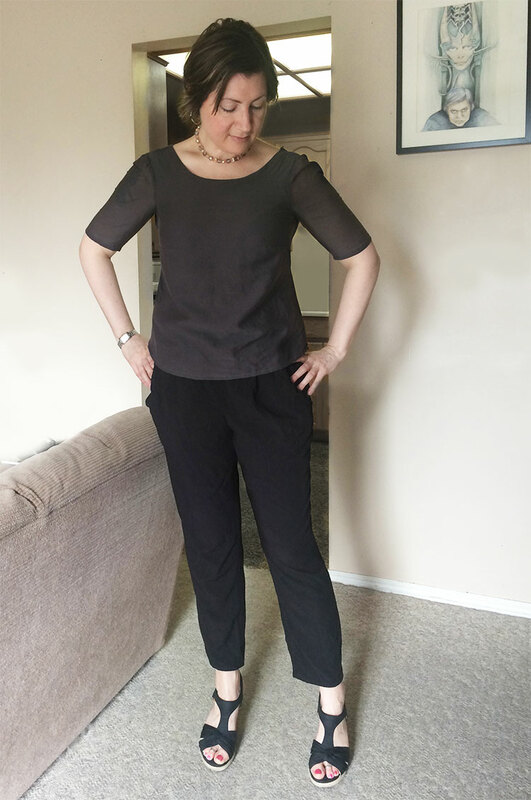 Further to my adventures with skinny jeans, I decided it was time to explore the non-bootcut style trouser in a new way 🙂 Enter Named’s Alexandria Trousers/Shorts – a pattern I fell in love with immediately and had to bump to the top of the queue. The first version of these I made from a mystery fabric in my stash, what I thought was perhaps a linen. It frayed like the dickens and pressed well, so I was probably not far off LOL. They turned out PERFECTLY except for some tightness in the calf (which I should have anticipated after the same thing with my Jamie jeans), alas, the first time I wore these, I knelt down to grab some shoes from the closet and RIIIIIPPPPPPP – out blew my right knee. (the pants knee, that is LOL). 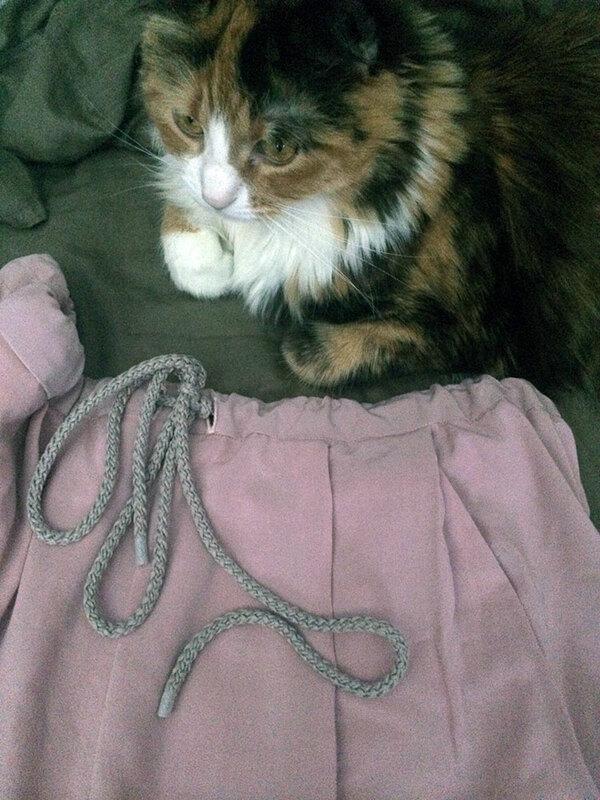 I also made the shorts version, in a blush pink rayon, which I haven’t had the opportunity to wear yet, as our weather has been pretty unpredictable, and not quite shorts-time. Also hence the grainy indoor pics – I continue to lament my lack of a decent photography spot…. it’s really appalling. Inspired once again by Anne’s numerous makes, I was turned on to the clean lines and versatility of this pattern. Although I really like the short version, I settled on the longer version first, as the fabric I used was more dressy and i wanted it to be wearable for both office attire and with jeans. I swear it’s pressed, but the fabric has a soft drape and texture, making it appear creased, which along with a burn test, makes me think it’s linen or a linen blend. I also added a self drafted sleeve head for a little extra support. The lining is a superb quality Bemberg rayon which is just a delight to touch and wear but as always, I despise sewing lining because Bemberg is notorious for misbehaving lol.